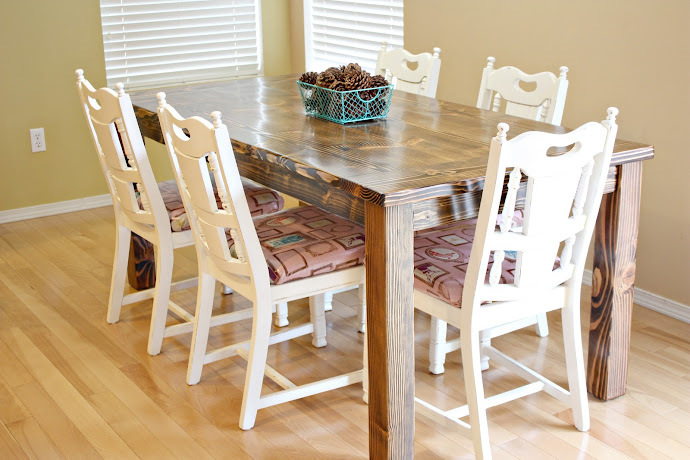 I recently shared our farmhouse dining room table and chairs, and today I’m excited to share a tutorial on how to reupholster dining room chairs with laminated cotton fabric! 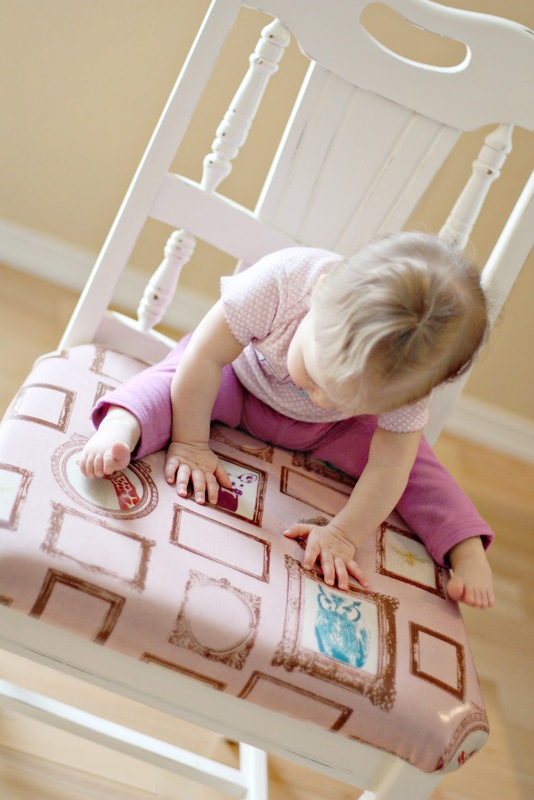 Anyone with little ones around the table knows how impossible the idea of upholstered dining room chairs sounds. 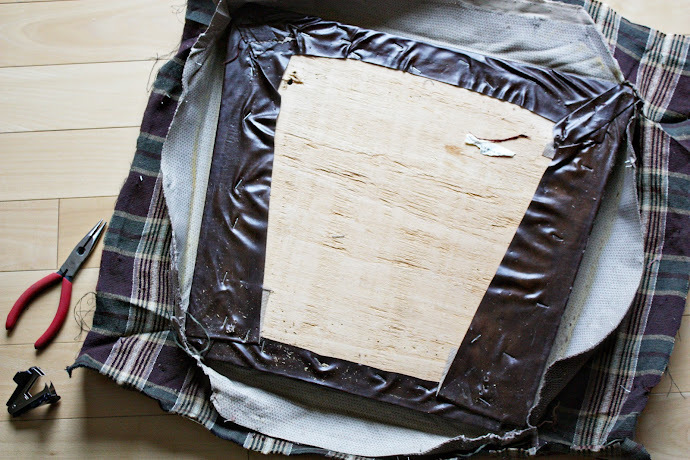 Luckily, we have laminated cotton to save the day. 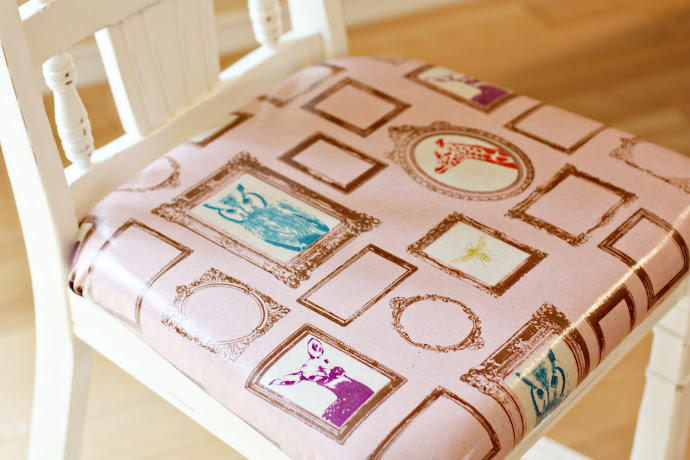 In all sorts of prints, laminated cotton is the perfect solution to having clean, wipeable chairs. 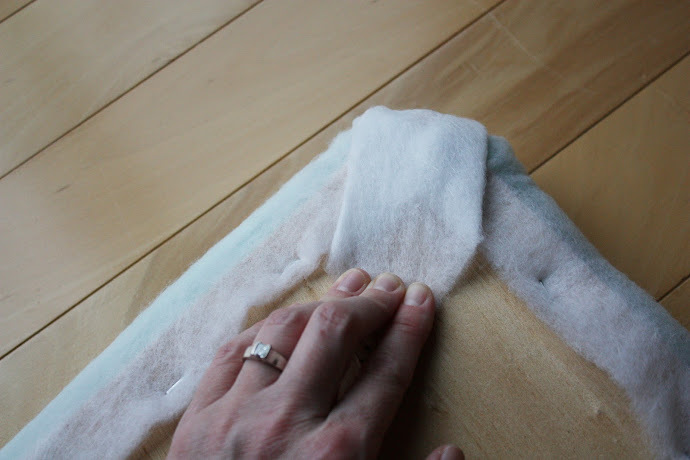 Laminated cotton is basically a quilting weight cotton with a polyurethane coating on one side. 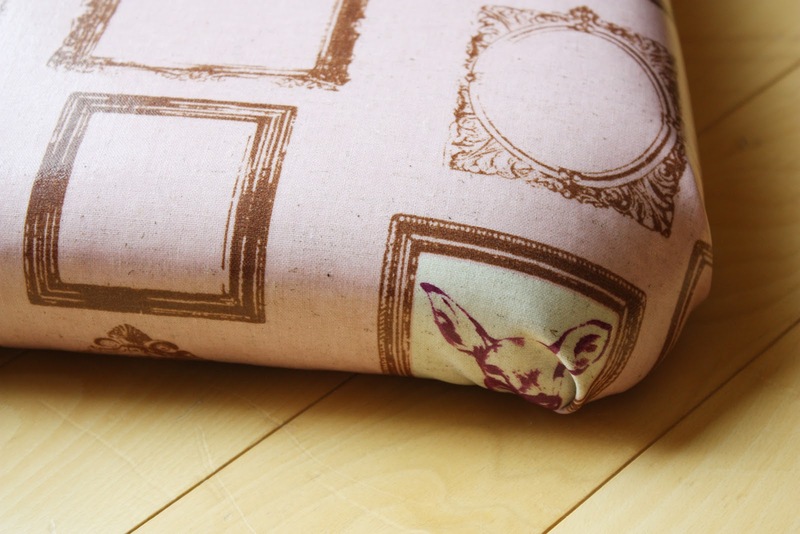 It doesn’t contain phthalates like oilcloth does, so you don’t have to worry about it being dangerous for your kids. 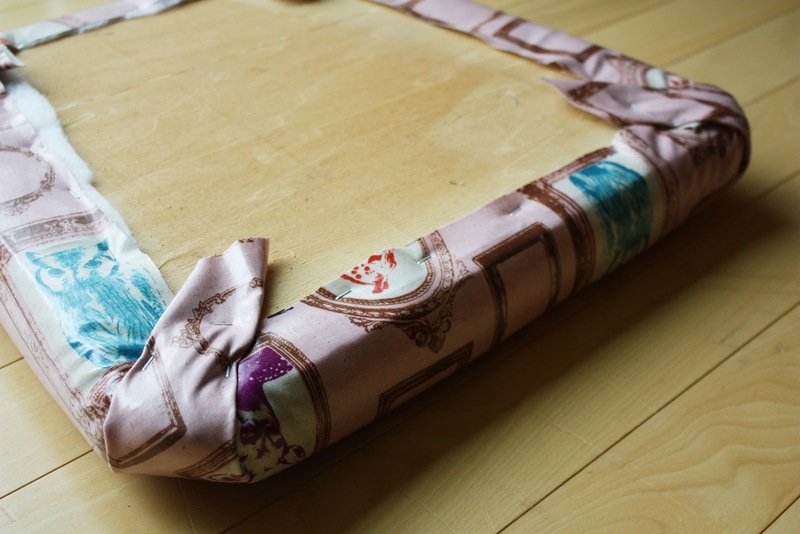 It’s also more pliable than oilcloth, making it easier to work with for certain projects. 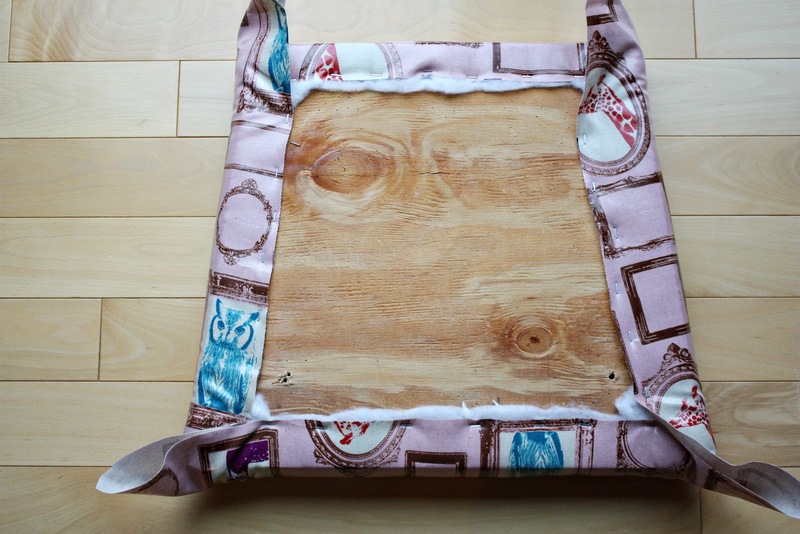 Ready to reupholster your own chairs? You may remember the before photo of the $5 Craigslist chairs, including the ugly plaid fabric on the seats. 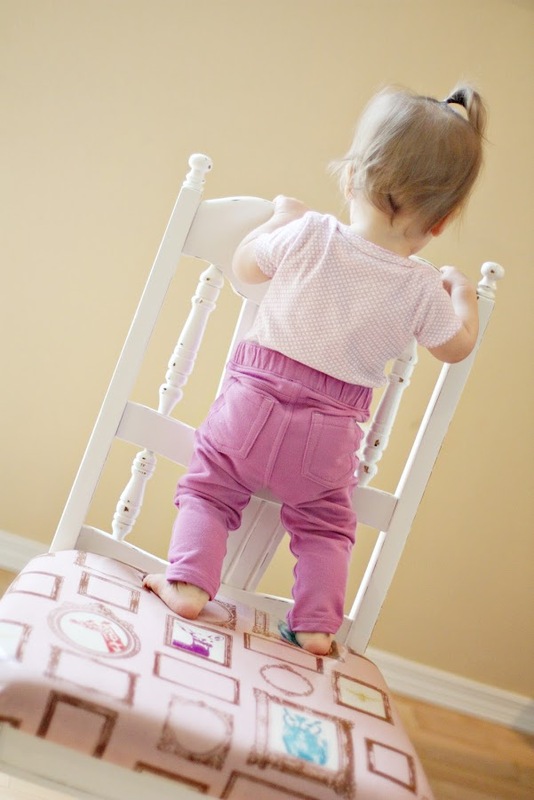 In the first post I explained a bit about the bad luck I had while trying to redo the chairs. 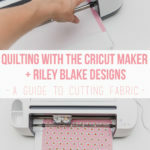 I had already waited over two months after ordering laminated cotton that was on back order, when I received an email from ModeS asking if I’d like to review one of their products. To be honest, I initially had no plans to accept the offer, as they are located in Hong Kong. Since I don’t often order products from overseas due to a fear of shipping hassles, etc, I didn’t think it would be up my alley. 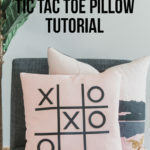 I decided to take a quick look at their products anyway, and as laminated cotton (or the lack there of, in my case) had been on my mind, I instantly was drawn to that section of the site. And then I saw THE fabric. 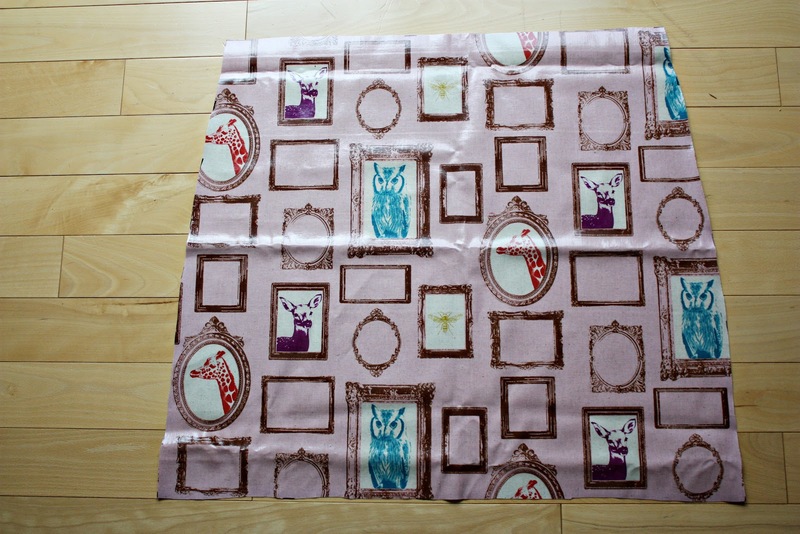 It was Echino laminated cotton in a print that I had never seen before on any site (and I’m pretty sure that by that time I had seen every site that carries laminated cotton :)). 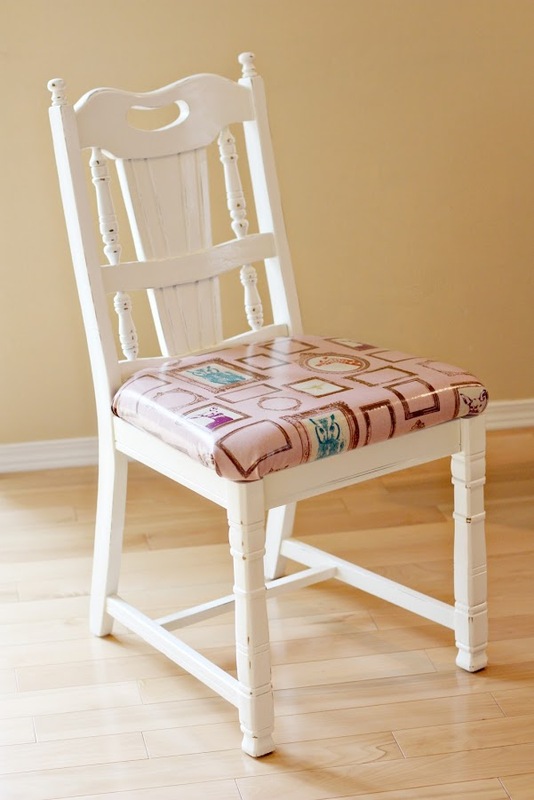 I was in love, and knew that I needed that fabric on my chairs. 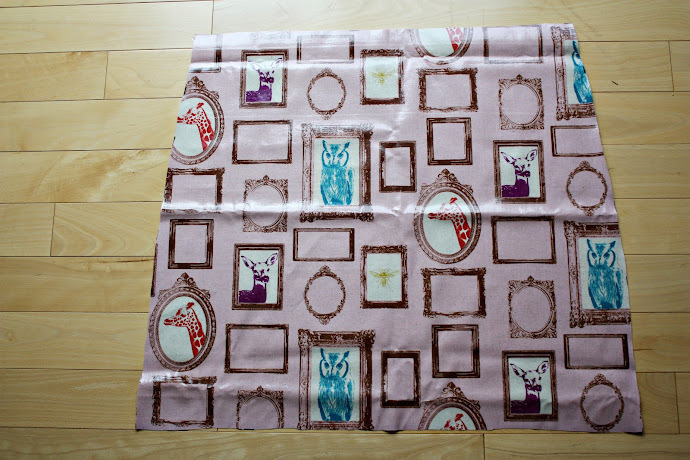 I was able to cancel the back ordered fabric that I had ordered from another site, and was so excited for the Echino fabric to arrive. I was surprised that it took less than two weeks from ordering until the fabric was on my doorstep. I have to say that I was very pleasantly surprised with my whole experience with ModeS on all levels. The selection was the best I’ve seen for laminates, the shipping was much faster than I expected, and my fabric came wrapped in cute Kawaii packaging, which is never a bad thing :). Once I had the fabric in hand, I was finally motivated to get to work on the chairs that had been sitting in my garage for months. 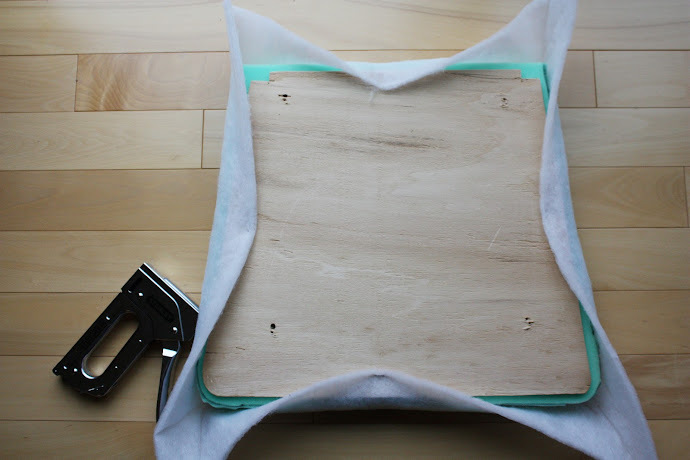 After I removed the seats from the chairs, I sanded, primed, painted, distressed, and protected the chair frames using the exact same process that I used for our buffet makeover. To recover the seats, use a staple remover to remove the existing fabric from the chairs. 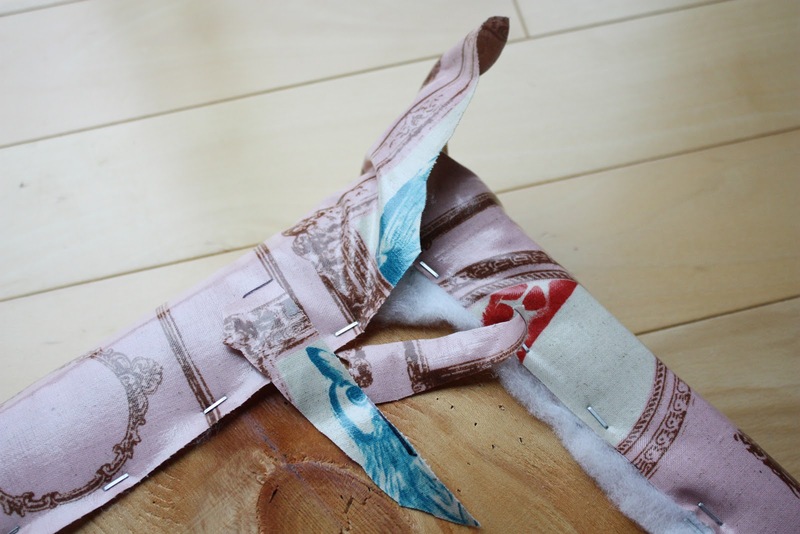 Pliers will come in handy, especially if the staples are older and tend to break. 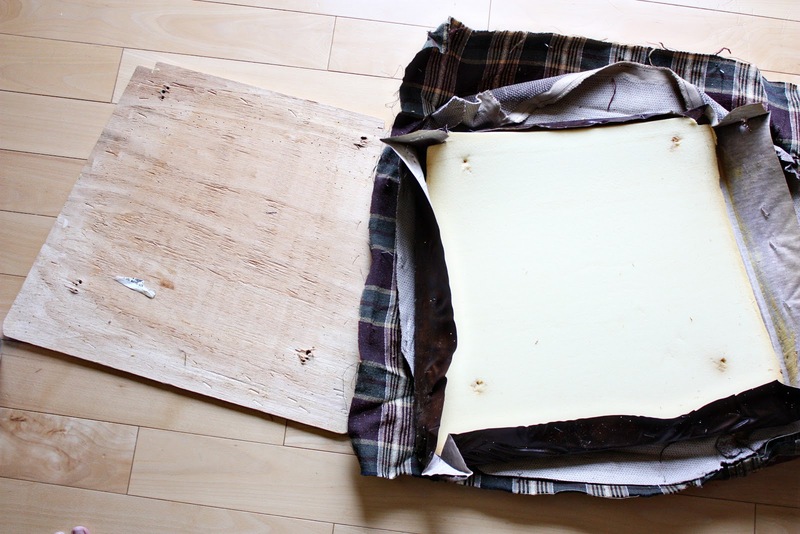 After all the staples, foam, and fabric layers are removed, throw them out! Yuck. 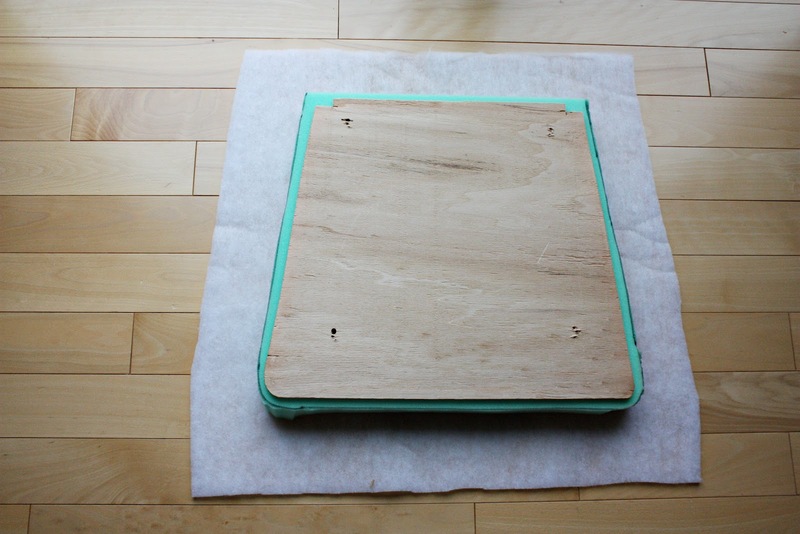 Unless your foam is still in good condition, you’ll only need to keep the wood seat base. 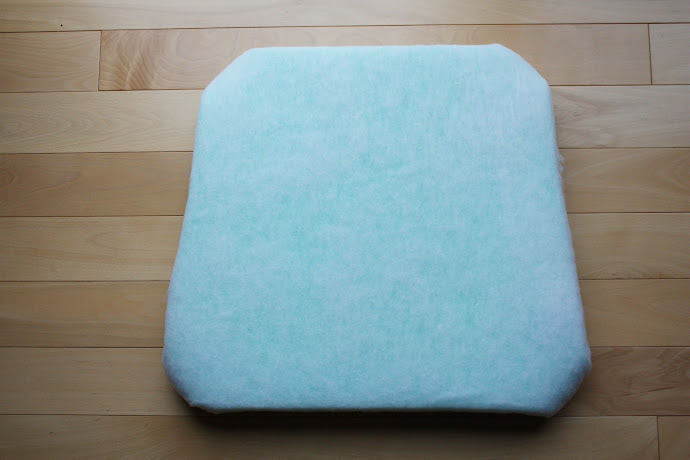 Use the seat base to trace a new foam shape. 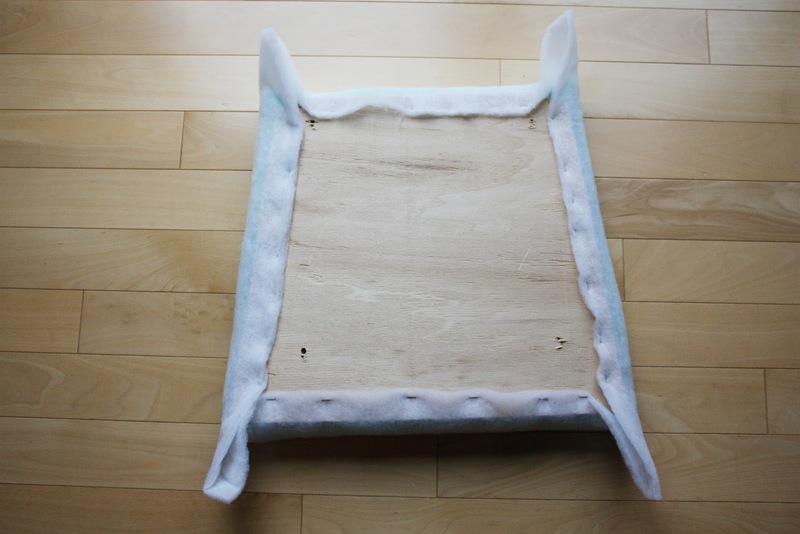 Trace the foam 1/2″ larger than the wood on all sides to allow for overhang and a smooth edge on the finished seat. Use an electric turkey carver to cut along traced line. 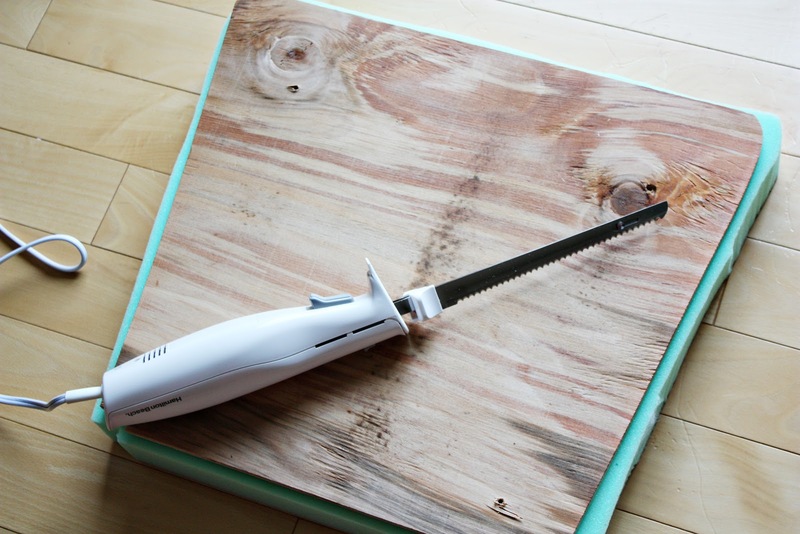 You can use a serrated knife if you don’t have an electric carver, but the carver will slice through the foam like butter and save you a lot of time, energy, and mess. 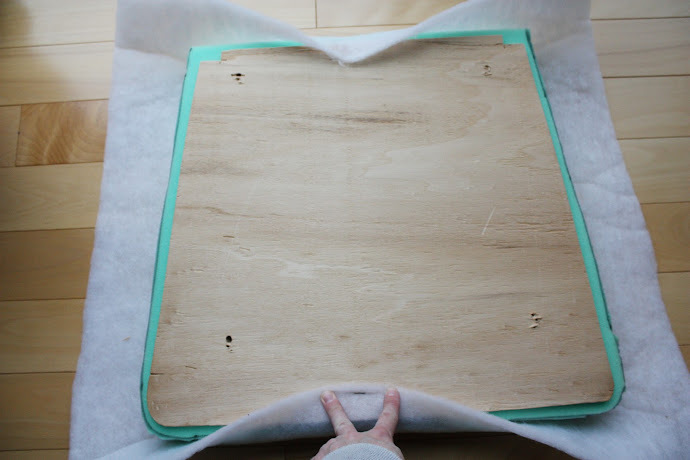 Once the foam is cut out, use a spray adhesive (make sure it’s specifically designed for wood and upholstery foam) to glue the foam to the wood. 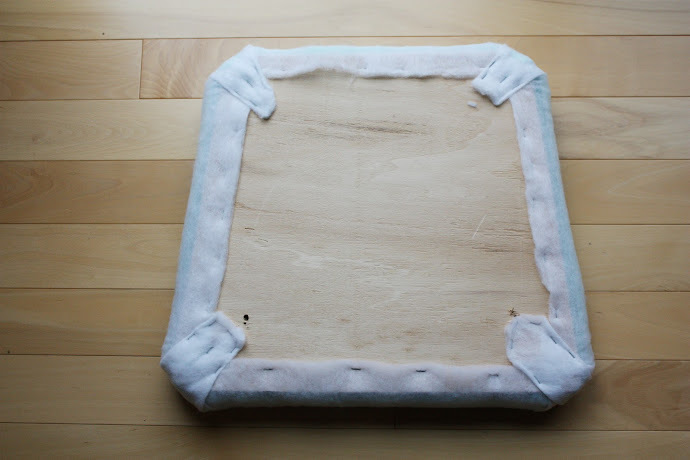 This will help the foam to stay in place while upholstering, as well as give it more stability when it’s in use. 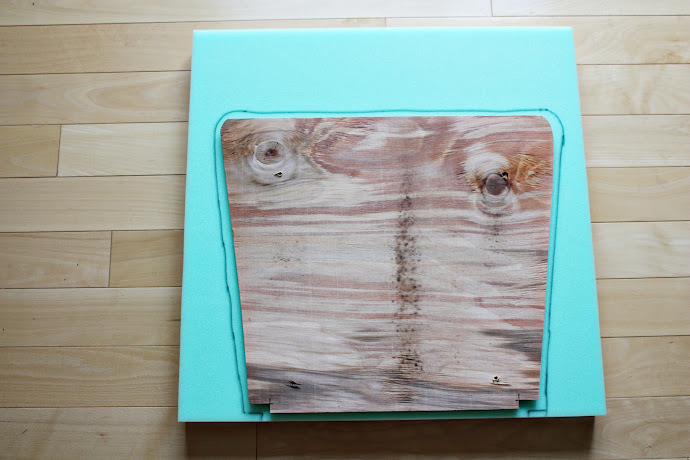 Place the seat over the batting and cut the batting approximately 3″ larger than the seat on all sides. The layer of batting will help to round the edges of the foam and make it easier when adding the laminated cotton, which is obviously less pliable than other fabrics. 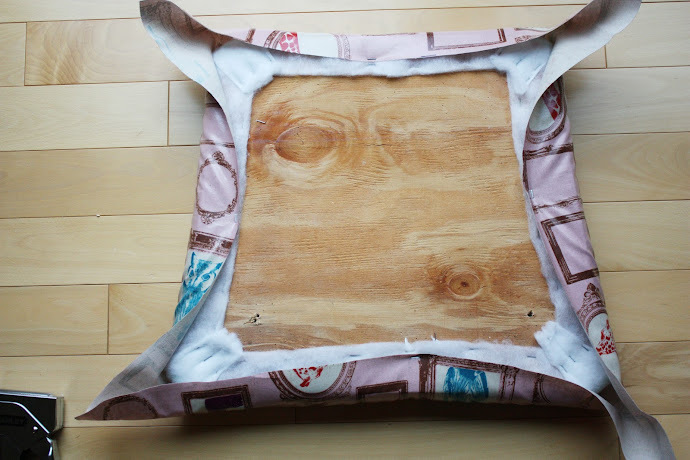 Once you have one piece of batting cut, you can use it as a guide to cut the other pieces of batting if you’re reupholstering multiple chairs. 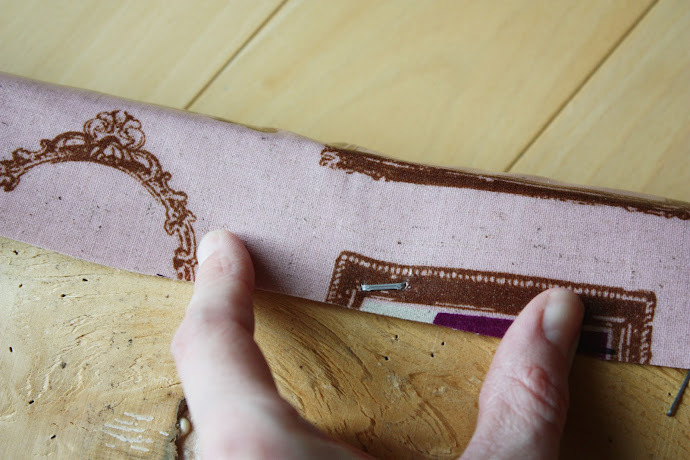 Pull the batting tight on the middle of one side, and staple it to the seat, placing the staple in between two fingers, rather than right next to your fingers. 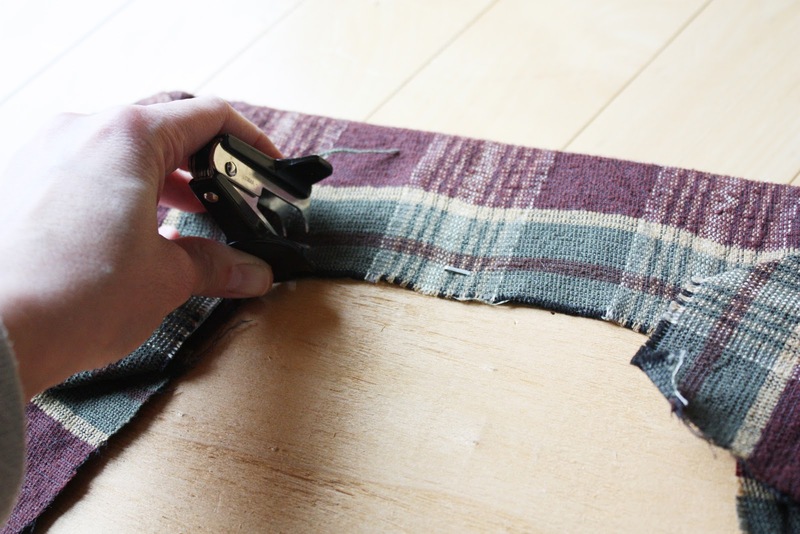 This will help to eliminate any uneven pulls in the fabric. Staple remaining two sides using the same method. Continue stapling opposite sides until all four sides of batting are stapled in place on the seat. Staples should be spaced approximately 1″ apart. To shape corners, fold and pinch batting as pictured, and pull back tightly toward seat. 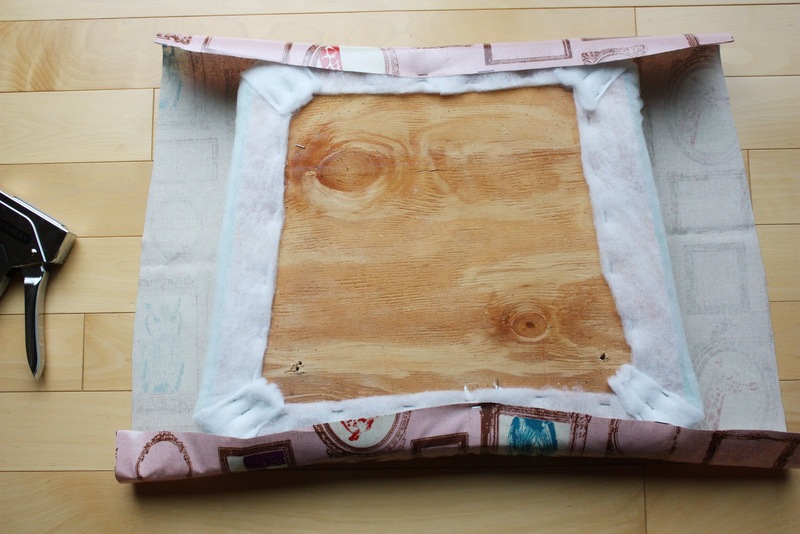 Hold snugly and staple corner in place. 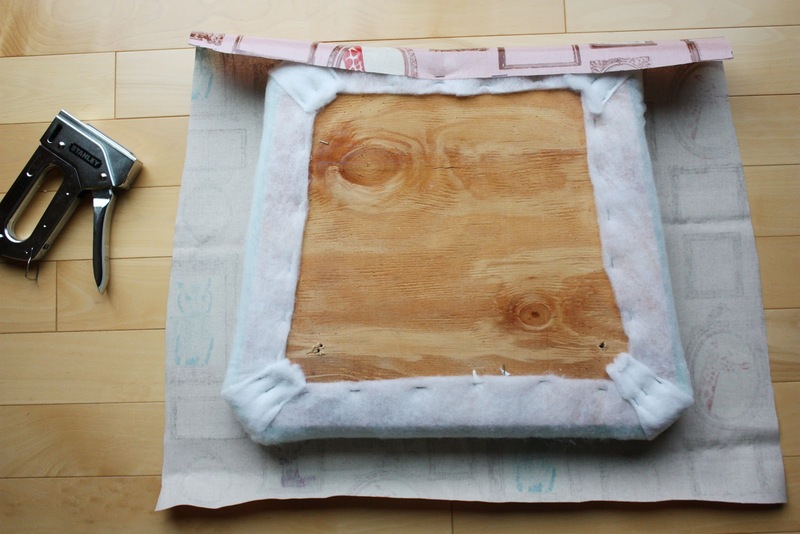 Place the seat onto the laminated cotton and cut the laminated cotton 3-4″ larger than the seat on all sides. 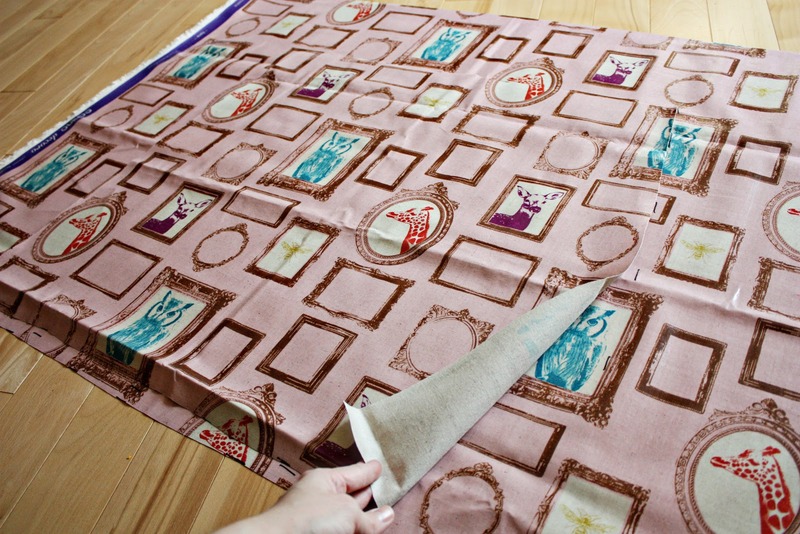 If using a directional print, be sure that the seat is positioned in the right direction before cutting! 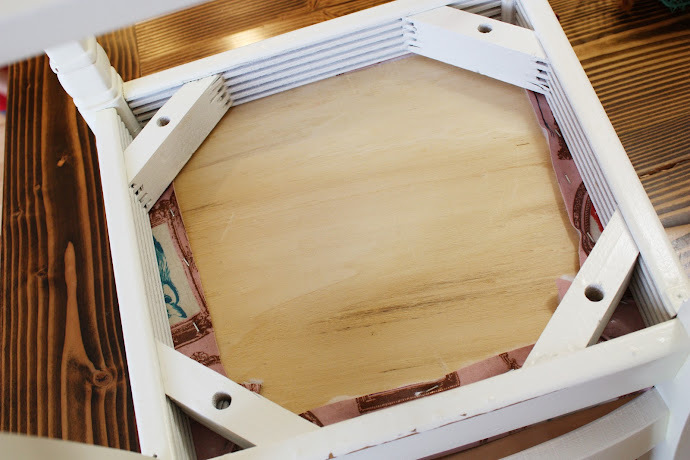 Also make sure you are centering the seat on the print as desired. 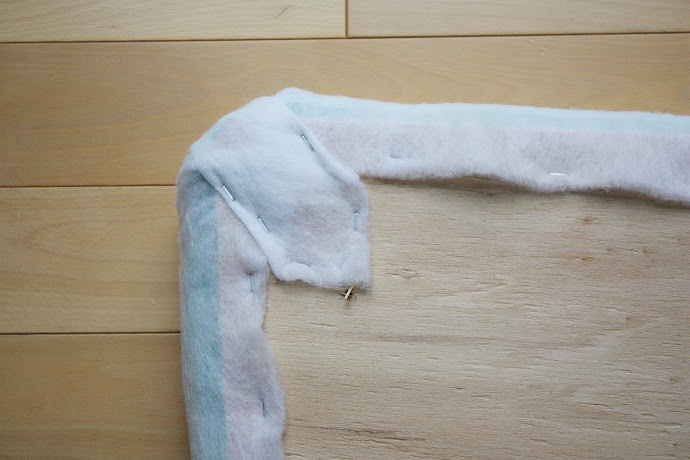 Remember that if you’re reupholstering multiple chairs, you can use the cut piece of laminated cotton as a guide to cut the other pieces. 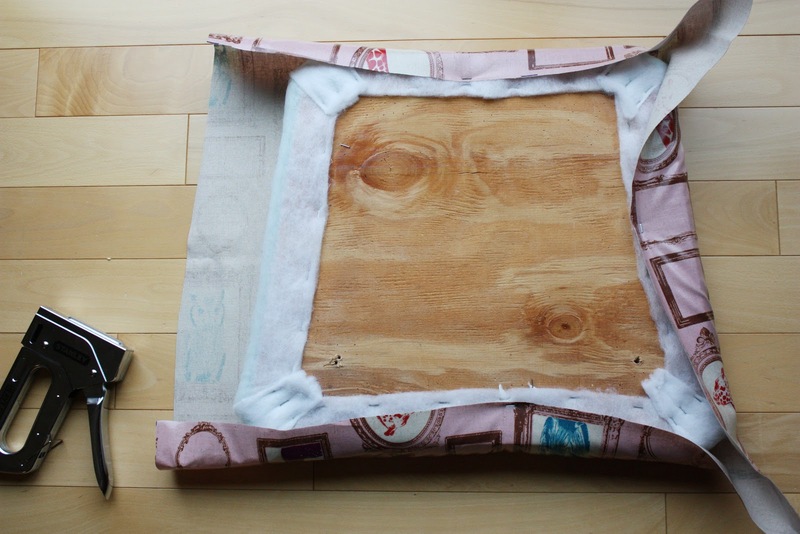 Use the same technique as was used with the batting to staple the laminated cotton to the seat. 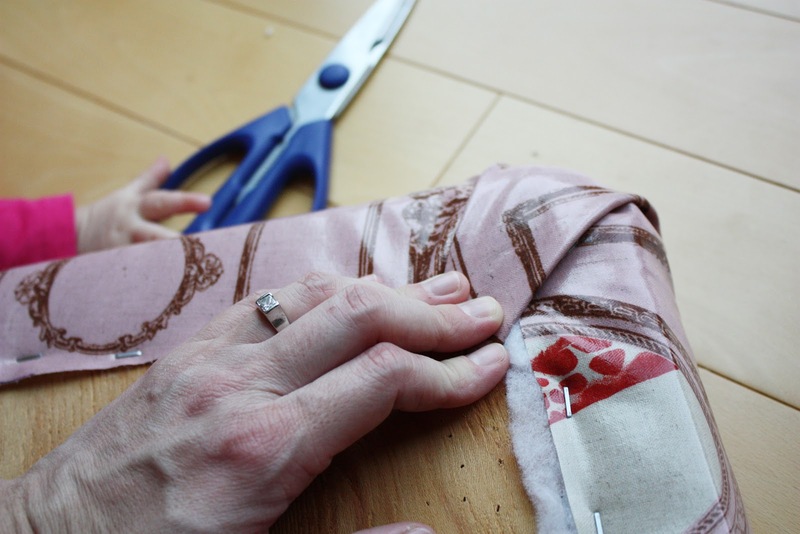 Pull the fabric tight (tighter than you may think), and place one staple on one side, being sure to staple in between two fingers rather than next to your fingers. Repeat with remaining two sides. 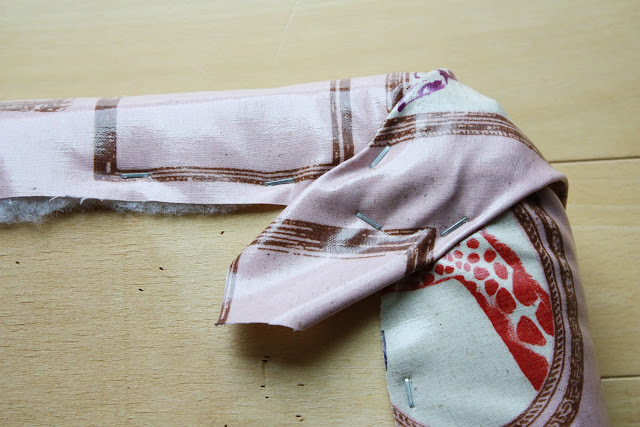 Continue stapling opposite sides until all four sides of fabric are stapled in place on the seat. If you notice any uneven pulls, use your staple remover and pliers to remove them and re-staple as needed. Shape corners by folding in similar fashion as batting. If you find there is too much bulk to make a nice neat fold, trim some of the excess before folding. 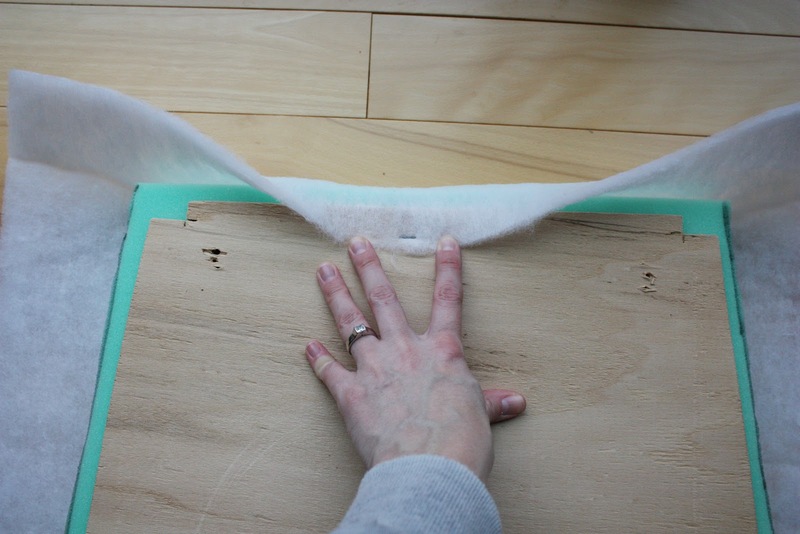 If you used 1″ thick foam, you may be able to fold the laminate so that the folds are only slightly visible on the right side of the seat. 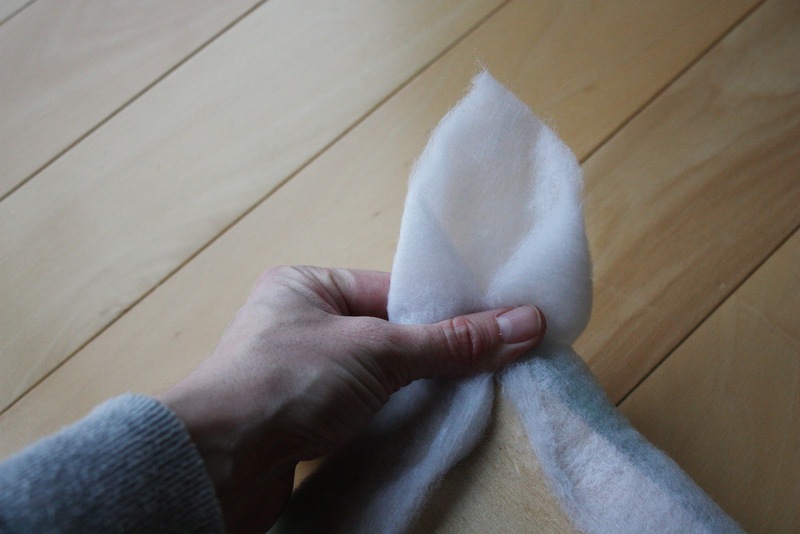 If using thicker foam like I did (mine was 2″), you’ll see more of the folds – try to make them as neat and uniform as possible. 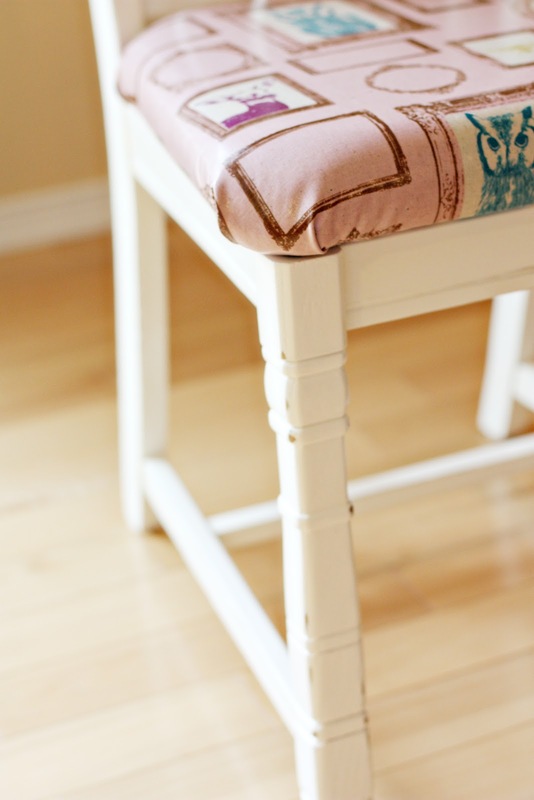 Use screwdriver or screw gun to reattach seats onto chairs. And even enjoy having sticky little hands on them :). 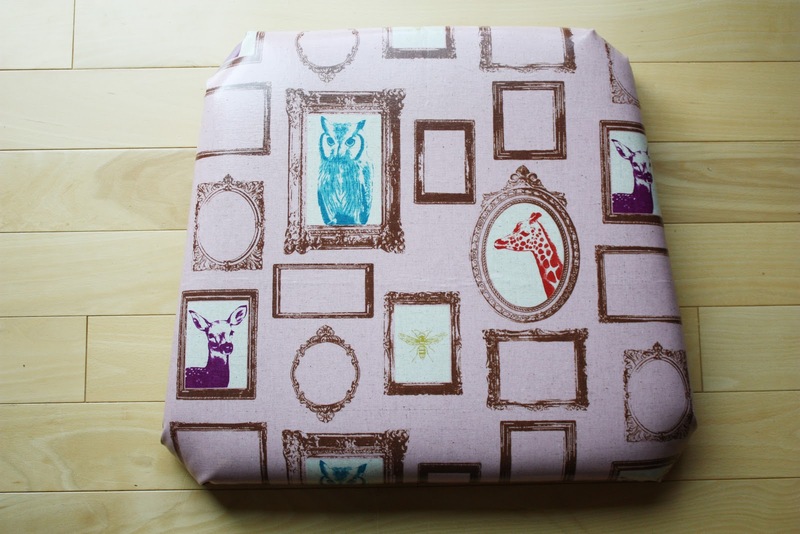 ModeS sent me the fabric used in this post in exchange for a review of the product. All opinions shared are my own and genuine :). I’ve been seeing this laminated cotton everywhere! 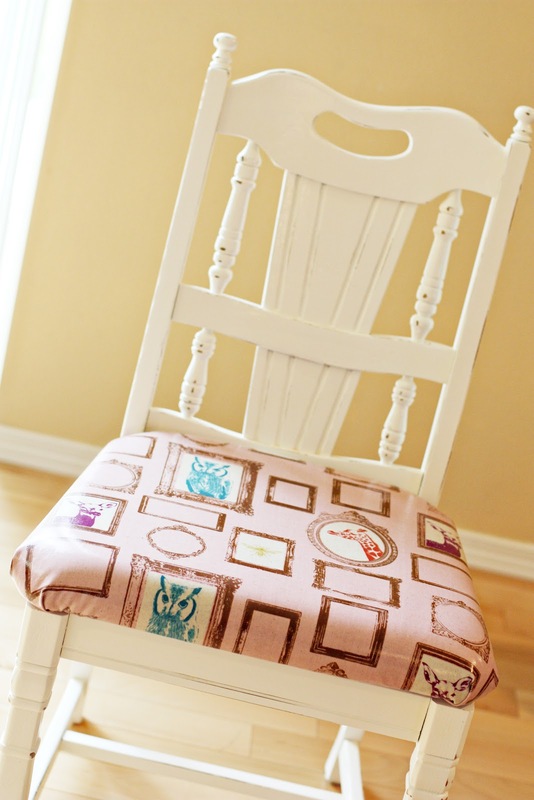 I recently redid my sewing room chair- & I’m kicking myself because there are such fun fabric choices in the. 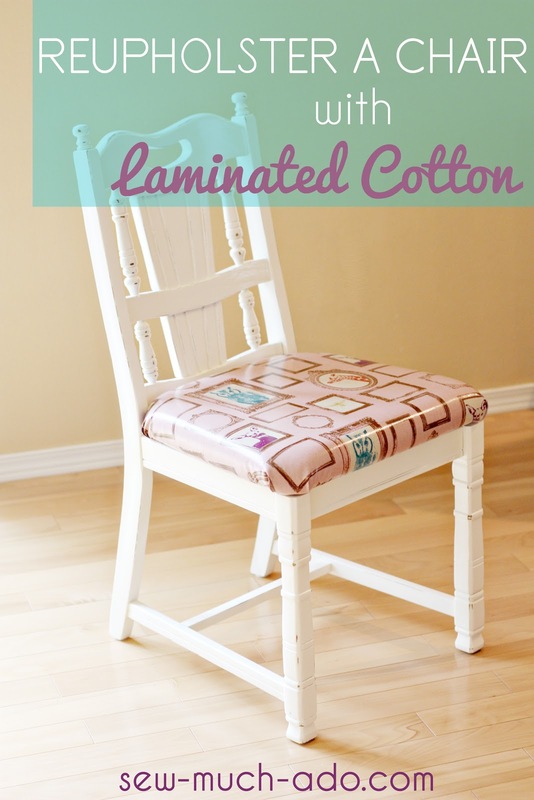 Laminated cotton! Next time, I’ll think outside the upholstery aisle! Gasp! Your baby is gorgeous! Oh, great job on the seats too *wink*. Pinned! I never even knew there was such a thing as laminated cotton! How awesome! 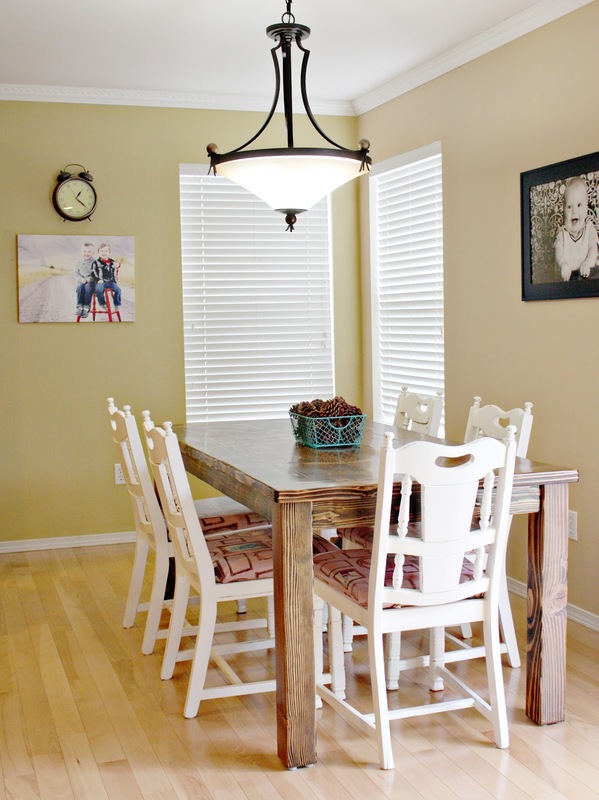 We have been on the lookout for a dining table and chairs to makeover, the cheap folding chairs we’ve had since our first apartment are so gross and not cutting it anymore! 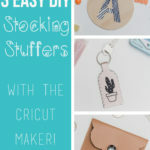 This is a great tutorial, and now I know to check out the laminated cotton! Thanks for sharing! 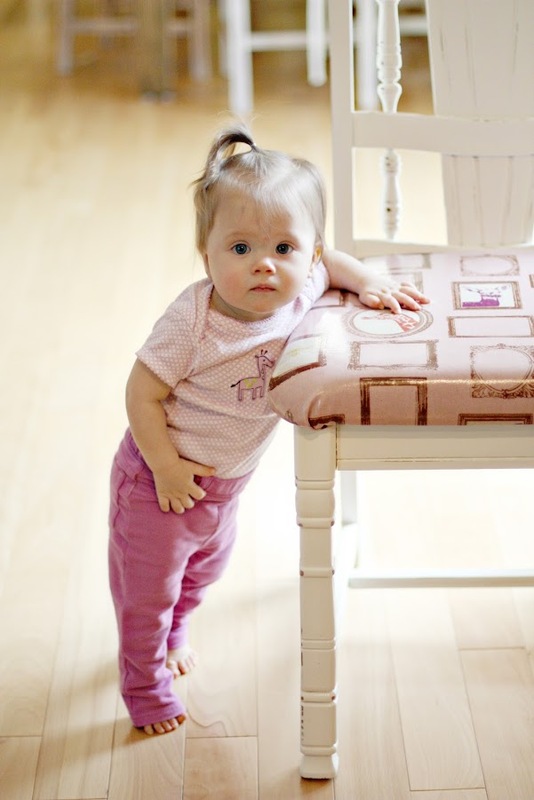 I love the chair and your baby is just too precious! 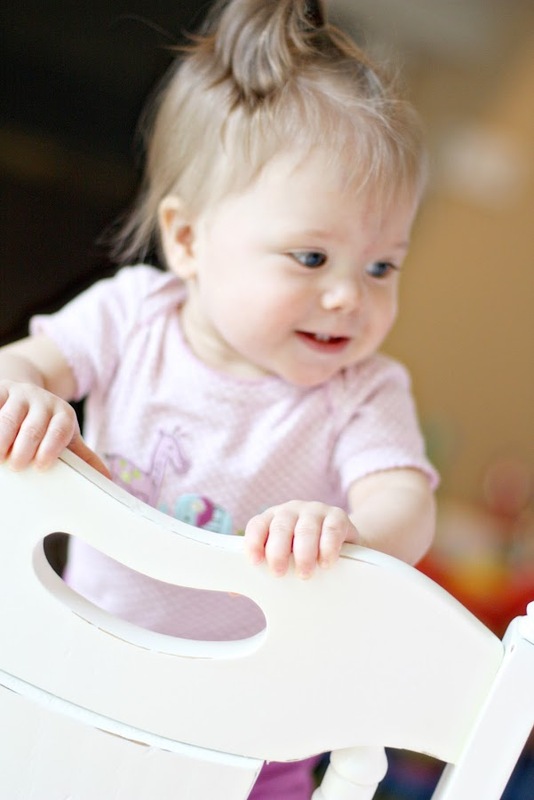 Your little one is too cute! 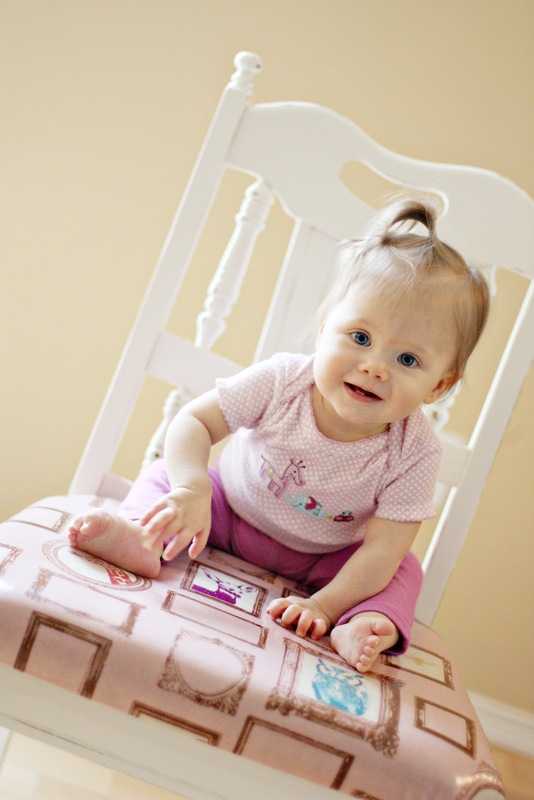 I definitely know what you mean about seat cushions and little kids! 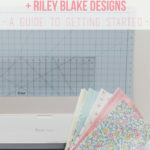 Great tutorial with lots of helpful steps and photos. Thanks for sharing at Monday Funday! Looks beautiful Abby! You’re so talented. Interesting post and thank you for sharing. There are things here that I did not think before.Thanks to cool such a position that is very well written. Hi Christine! They have held up really well. As of now, they’re still as good as new :). 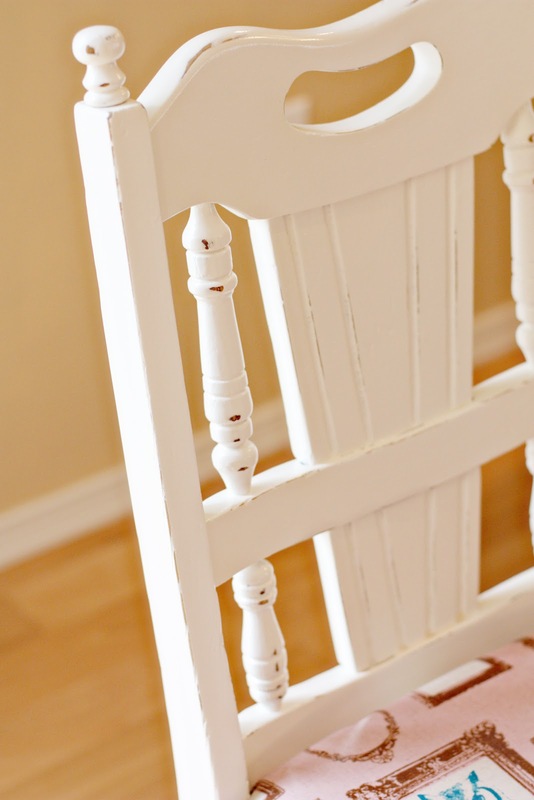 I would avoid using any harsh cleaners, as it may cause the plastic coating to break down over time, but I haven’t had any issues with our chairs and still love them!